Jurnal Riset Akuakultur have p-ISSN 1907-6754; e-ISSN 2502-6534 with RISTEK DIKTI Accreditation Number: 21/E/KPT/2018, 9 July 2018. First published in 2006, with the publication frequency of four times a year, ie in March, June, September and December by Research Center for Fisheries, Agency for Marine and Fisheries Research and Human Resources. 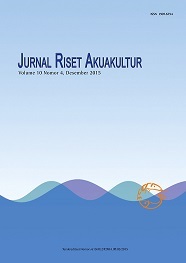 Jurnal Riset Akuakultur as source of information in the form of the results of research and scientific review (review) in the field of various aquaculture disciplines include genetics and reproduction, biotechnology, nutrition and feed, fish health and the environment, and land resources in aquaculture. Manuscripts that submitted to Jurnal Riset Akuakultur should be consistent with Focus and Scope, then verified according to Guidelines including plagiarism using standard Plagscan and Turnitin as plagiarism detection software, Google Scholar by the Assistant Editor. The author should attach the Results of Plagiarism Analysis and statement regarding the originality of manuscript. After complying with the writing format and passing plagiarism, the manuscript will be distributed to the Editorial Board by Editor in Chief to be reviewed. The next step the manuscript will be sent to Peer-Reviewer with Double Blind Review. The final stages of manuscript will be accepted or rejected by Editor in Chief in regular Editorial Board meeting. The rejected manuscript will be resubmitted to the author. The editing manuscript will be verified with the same Plagiarism system by Assistant Editor. Proof readings will be done to the Editor in Chief and Author as the final draft for publishing process. Indexed by World Cat, Cross Ref, Scilit, Sherpa/Romeo, Indonesian Scientific Journal Database (ISJD), Google Scholar, Directory Open Access Journals (DOAJ), One Search Lancaster University, BASE, British Library, Mendeley, Science and Technology Index (SINTA), GARUDA and Dimensions.